With SO much interest in my old-fashioned, no pectin added, gourmet preserves, we’ve started ‘putting-up’ jars to sell on a first-come first-served basis. GMO and Gluten Free. 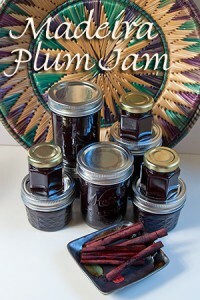 ~ This sophisticated cinnamon-spiced plum jam made with Madeira wine was an early inspiration for my preserves forays. Our 2014 batch is fantastic! Couldn’t stop taking spoonfuls of our family’s jar. It’s a lovely addition to winter holiday meals or given as a gift. GMO Free INGREDIENTS: No-spray Santa Rosa Plums, Filtered Water, Organic Golden Cane Sugar, Madeira Wine, Whole Organic Cinnamon Sticks & Love. 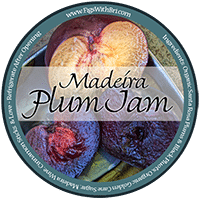 Just had the pleasure of picking up a few of Cynthe’s fine jams and conserves and the Madiera Plum Jam was one of them… WOW! Rich & sweet yet still subtle enough for other flavors to come through… and the magic blend of cinnamon with the plums and pluots is perfect! I could see this pairing with savory dishes as well as just yummy jam for toast and other bread bits. Thanks! for your enthused review Tien. GLAD you’re enjoying the Madiera Plum Jam. I agree, it would be tasty with savory dishes as well. Guess I’d better get hopping making inventory of this flavor for the holidays. Have a friend with a Santa Rosa plum tree…and a note on my calender to give him a call. Will do! Have a great weekend.